St. Patty's Day was quite fun this year. I'm always up for partying with the kids in their classrooms at school. Last month I went in with fried rice and fortune cookies for Chinese New Year and mentioned to my son's 2nd grade teacher that maybe I'd make Irish soda bread for St. Patrick's Day. I told her I wasn't any good at making corned beef and cabbage or I'd bring that in. She told me that her mom's corned beef was great and she'd see if she could talk her into making it or showing her how. A few days before St. Patrick's Day, another mom told me she was going to make Green River floats, which I thought was a great idea. So, on March 17, I showed up with Irish soda bread (I did intend on baking it, but there just aren't enough hours in the day and the Strack and Van Til bakery probably did a better job than I would have) and Green River soda and vanilla ice cream. Ms. P's mom brought in two huge casserole dishes filled with corned beef, potatoes, cabbage and carrotts. Oh, yum! 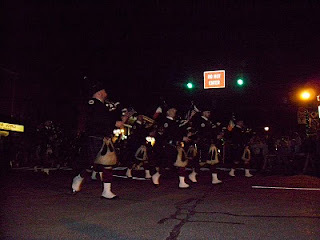 In the evening, we drove out to the Lake County courthouse to watch Crown Point's 2nd annual evening St. Patrick's Day parade. Couldn't believe the crowd. As I was there celebrating my Irish pride (my ethnic heritage is mainly British, with some Scottish, Irish and Native American thrown in), up marched the Band of Brothers Pipes and Drums group - which elicited another kind of pride. The group is made up entirely of area firefighters, including some of my husband's co-workers. For families of firefighters, the sound of bagpipes seem to bring forth emotions. They sound beautiful, yet eerie. I saw the group perform last year on 9/11 at a benefit and just left in awe of these people and the profession they've chosen. They really are heroes. I felt pride at being married to one of the men in that brotherhood known as the fire service that is unique to any other career out there. Many days at the firehouse are monotonous and routine, but for the risks that may or may not be awaiting them when the tones go off, the unpleasantries they deal with from the public as firefighters and paramedics and the heartbreak they face when their strongest efforts aren't enough to save a child, I applaud them all for doing what they do. I sure couldn't do it.